How Far Along: Twenty-four weeks (+ a few days). Officially in the sixth month. Size of Baby: A cantaloupe. That seems so big to me. (She's about 12 inches from head to toe and weighs approximately 1.3 lbs). My uterus is apparently the size of a soccer ball now, which blows my mind. The female body is amazing. Cravings: No real cravings. I've been trying to up my protein intake as per recommendation from my midwife, so I'm enjoying lots of eggs, whole milk, Greek yogurt, peanut butter & cheese. Can't really complain about that. Weight Gain: Depending on the time of day I step on the scale, anywhere from 7-9 lbs since pre-pregnancy. Hoping that the increase in protein helps me to pack on the pounds a bit. My mom says she only gained 17 total pounds with me, and both Tiho and I are relatively small people, so I'm guessing we'll have a smallish baby? Who knows! Maternity Clothes: Mostly pajamas? Unless I have somewhere to be, I don't really get dressed (oops!). It's August and it's hot. When I do make it out of the apartment, I favor my black Gap maternity dress or maternity denim shorts with a t-shirt or tank. Physical Symptoms: Actually, nothing major at all! 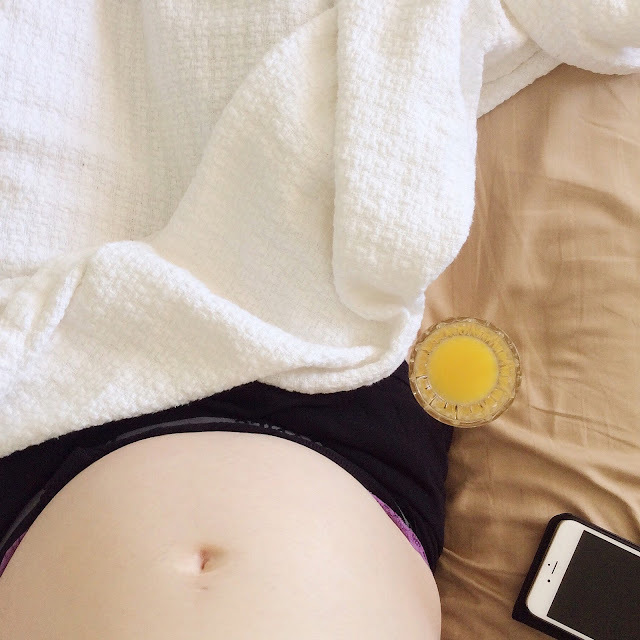 I think I'm in the "sweet spot" of pregnancy. I'm only a few weeks away from entering third trimester territory, so I'm trying to enjoy this magic time when I feel "normal." (That picture is ironic, because I actually took it when I was feeling sick and super low energy, which is rare). Her little kicks are far and away the best thing about this past month. She is totally on a schedule and it makes me laugh every day (kicking regularly around 9 AM, before & after meals, and from 10 PM until about Midnight). Sleep: Sleep is great! I am obsessed with my Luna pillow and sleep about nine hours every night. Fears: I try not to worry too much but sometimes I let my mind go to all of the horrible places. This mostly happens when I hear news stories about infants dying from SIDS or rare childhood diseases. It's so hard not to worry about the things you have no control over, but I'm also pretty good about snapping out of it and just praying for a healthy, happy kid. Welcome to parenthood, right? Baby's Developmental Milestones: She is getting strong! And her skin is getting pinker and less translucent. Apparently, she knows her way around in there: directionality develops at this stage, or at least a sense of up vs. down. General Mood & Emotions: Peaceful, happy, eager. Also, ridiculously lazy. It's unbelievably nice not having to commute to work every day (save for occasional client sessions) but I am going a little bit stir crazy since I mostly hang around at home. I'm nearly all caught up on my photo editing and am watching plenty of HGTV. I wish we belonged to a pool because I would be swimming daily. The second half of August and early September is busy for us, so I should just shut my mouth and enjoy these slower days. Things I'm Looking Forward To: Seeing lots of friends and family in the coming weeks for a variety of events (BBQs, bridal and baby showers, my 29th birthday, cousin weekend, etc.). Also, using my new electric toothbrush! I know, so random, but I finally went to the dentist and she gave me such a good cleaning to help with my swollen gums. It hurt a lot (my knuckles were white, and when it was over, I was drenched in sweat), but now my mouth feels sparkling clean and I have zero gum sensitivity. Oh, and I'm also looking forward to packages arriving in the mail! Our registry was shared with close friends and family last week, and it's fun to see what's been reserved already (my mom and sister are throwing us a baby shower in September). Coolest Thing So Far: Feeling her kick a crazy amount when I was snuggling in bed with Tiho. It felt like she knew she was nestled right there between us and was telling us "hey!" Thanks, Mama! Love you too. omg you went to the dentist!! I made that mistake while pregnant, had to get orajel I was in so much pain after :) Sounds like you are doing so so great! So happy for you and so jealous if your current 9 lbs! I gained 45 total! Enjoy every minute, though it looks like you totally are! Omg, Kati, the dentist was traumatizing. Pregnancy hormones are seriously no joke. I joked that if I survived that, I could survive natural childbirth. Both the dentist and hygienist laughed at me.